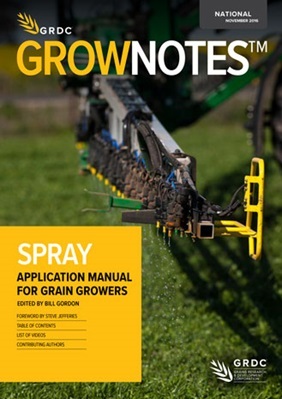 The latest Grains Research and Development Corporation (GRDC) GrowNotes publication, released in digital and video format, contains expert tips on spray application and drift management. The Spray Application Manual for Grain Growers provides information on how various spraying systems and components work, along with those factors that the operator should consider to ensure the sprayer is operating to its full potential. GRDC managing director Dr Steve Jefferies said spraying application was an integral activity in modern grain farming systems and one that necessitated careful planning, preparation and implementation. “The control of weeds, diseases and pests in a timely manner, while minimizing risks to the environment, requires that the spray operator has a good understanding of all the components that can influence the outcome of each spray job,” Dr Jefferies said. The manual includes practical information – backed by science – on sprayer set-up, including self-propelled sprayers, new tools for determining sprayer outputs, advice for assessing spray coverage in the field, improving droplet capture by the target, drift-reducing equipment and techniques, the effects of adjuvant an nozzle type on drift potential, and surface temperature inversion research. The manual comprises of 23 modules and each of these features a series of videos to deliver advice to growers and spray operators in a visual, easy-to-digest manner. Spray application expert Bill Gordon is the editor and lead author of the manual. Mr Gordon has delivered projects on behalf of the GRDC and other industry groups that have provided training on spraying best practice to more than 10,000 Australian grain growers. Several other key industry players, from throughout Australia and overseas and with decades of experience in various aspects of spray application, have also contributed to production of the manual. Click here to visit the GRDC website for more information and to download the manual or individual modules.